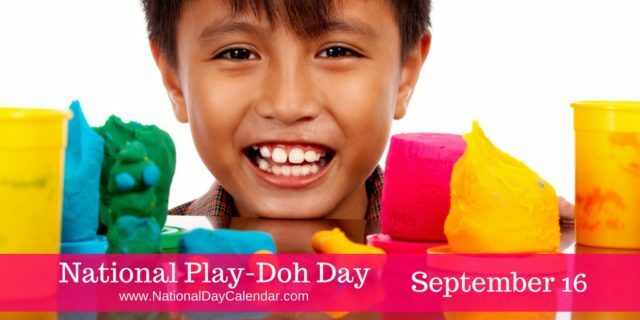 National Play-Doh Day is observed annually on September 16th. Play-Doh inventor Joe McVicker actually sold it originally as a wallpaper cleaner but the world had another use for his product. Play-Doh was inducted into the Toy Hall of Fame in 1998. Play-Doh was originally developed in the 1930’s, not as a toy but as a product for cleaning wallpaper! It was not until the 1950’s that it was marketed as a toy, in the trademark vibrant colours of red, blue, yellow and white. McVicker showcased the modeling clay at a national education convention in 1955, and word spread to Macy’s and Marshall Field’s. Since 1956, more than 3 billion cans of Play-Doh have been sold. That’s enough to reach the Moon and back a total of three times. If all that Play-Doh were rolled into a giant ball, it would weigh as much as 2000 Statues of Liberty! Captain Kangaroo endorsed Play-Doh, When it was just a fledgling company with no advertising budget, inventor Joe McVicker talked his way in to visit Bob Keeshan, a.k.a Captain Kangaroo. Although the company couldn’t pay the show outright, McVicker offered them two percent of Play-Doh sales for featuring the product once a week. Keeshan loved the compound and began featuring it three times weekly. The Fun Factory let kids extrude the material into interesting shapes, making mock hair, colorful spaghetti, and pretend ice cream that wouldn’t melt. In the 1980s, Play-Doh expanded its palette to eight colors. Later versions sparkled with glitter, glowed in the dark, or smelled like shaving cream.